The debt-snowball method is a debt reduction strategy for revolving credit (credit cards and other unsecured lines of credit) that can be applied when you have one or more debts and can afford to pay at least the minimum required payment. The basic snowball plan pays off the accounts starting with the smallest balances first while paying the minimum on larger debts. Under this method, extra cash is dedicated to paying debts with the smallest amount owed. Once the smallest debt is paid off, one proceeds to the next slightly larger small debt above that, so on and so forth, gradually proceeding to the larger ones later. The primary benefit of the smallest-balance plan is the psychological benefit of seeing results sooner. This method has gained more recognition recently because it is the primary debt-reduction method taught by many financial and wealth experts, such as Dave Ramsey. I highly recommend starting out with his book, The Total Money Makeover. Buy it used or borrow it and it may very well change your outlook on the burden that debt can place on you and your family. His approach is fairly preachy, which may turn off some, but the core message is very important. Snowflake payments are any additional payments other than the snowball that you can apply towards your debts. For example, if you are planning on getting back a tax return and would like to apply it towards your debts, just go to the snowflake management page and add it to the month you will make the payment. You can add as many snowflakes for each month as you want. Undebt.it will total them up and make the proper calculations. Negative amounts are also supported if you know you will not be able to make the full snowball payment. The snowball method has proven to be a very effective method to getting out of debt, but you may pay just a little more in overall interest than another method - the debt-avalanche method, also known as "debt stacking". 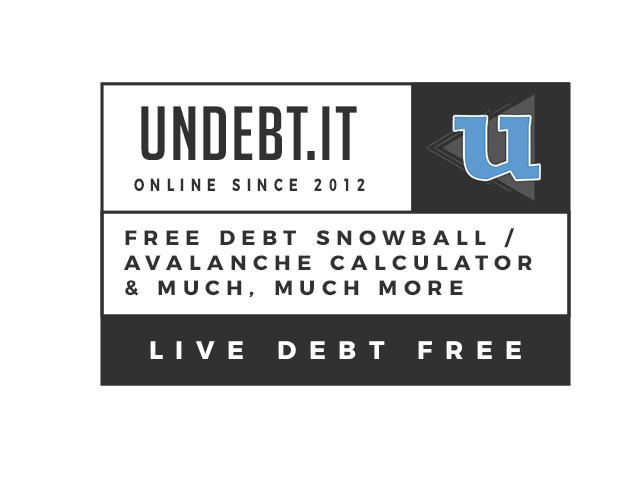 The avalanche method is similar to the snowball, but instead of starting out with the highest balance debt, you start with the debt with the highest interest rate. I usually recommend starting out with the snowball method because the motivation of paying off some smaller debts quickly will help you stick with it, then switch over to the avalanche method. Both of these methods are fully supported by Undebt.it and you should choose which one you think will work best for you. Use the snowball table to see which method will give you the best results. Undebt.it also supports custom payment methods where you will be able to pick the order of the payment plan. There is even a payoff method where you can payoff the accounts with the highest monthly payment. Last but not least is the Debt Blaster payment plan - you incrementally increase your budget over time to get out of debt in no time. You will only find the Debt Blaster plan here at Undebt.it. The short answer to this question is "it doesn't matter". As long as you're adding the extra amount to your debts each month, you're on the right track. Unless you are dealing with huge debts like mortgages, it doesn't really matter which method you use. Your payoff month will probably be within a month or two for each of the payoff methods. The chart below is an example of a pretty average set of debts. Use the plan that works best for you.